Words matter. 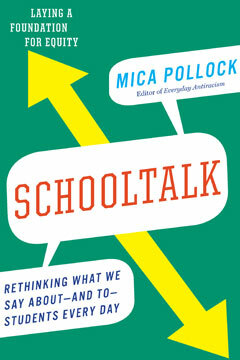 The offhand remark to a student or parent about the community in which she lives; the way groups—based on race, “culture,” and income—are discussed in faculty meetings about test scores and data; the assumptions and communication breakdowns between counselors and teachers that cause kids to fall needlessly through the cracks; or the deflating comment to a young person about his college prospects: all these words have tremendous power. They are, in fact, actions that undermine efforts to maximize the potential and talent of all students, every day. In this essential guide to bringing equity to schools, Everyday Antiracism editor Mica Pollock offers tools—common scenarios paired with useful exercises, concrete actions, and valuable resources—to help educators match their speech to their values. Everything that is—and isn’t—communicated to and about students has serious implications for their success. Schooltalk will empower those who work with young people to foster the equity that is necessary for our schools and communities to thrive.